Nobuhiro Kikuchi is the executive producer at animation studio P.A.WORKS. 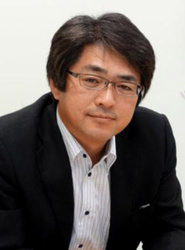 As producer, Kikuchi has worked on anime series such as True Tears, Hanasaku Iroha: Blossoms for Tomorrow, and The Eccentric Family. Kikuchi's involvement in animation projects brings a high level of collaboration between the animation studio and the local area in which the anime takes place. With this unity, the creators are able to enchant the audience with a unique sense of reality and fascination. Kikuchi was born in Toyama prefecture in 1964. He went to the same college as Kenji Horikawa, founder and CEO/producer of P.A.WORKS, but Kikuchi chose a different profession, other than animation. After establishing P.A.WORKS, Horikawa invited Kikuchi to join him. Kikuchi brought a new perspective to the animation, which led to unique developments at P.A.WORKS. In Hanasaku Iroha, the Bonbori Festival is a festival that existed only in anime, but with the combined efforts of Kikuchu, the show's other creators, the local community, and the fans, it materialized into a real traditional style festival that is held every year, with over 10,000 people attending it. Kikuchi also produced Koitabi: True Tours Nanto, a unique smartphone app that brings together tourism and animation entertainment to create a unique experience for touring the city of Nanto, Toyama.